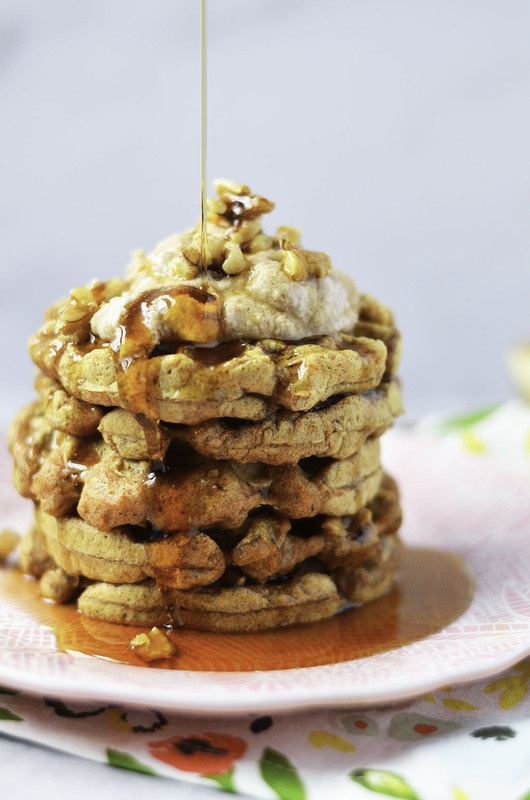 A healthy take on the classic carrot cake, made into pancakes that are sure to please everyone! I pair it with an irresistible cinnamon cashew cream cheese that you can’t help but lick right out of the bowl! Best of all, these pancakes are oil-free, gluten-free, and entirely vegan. Carrot cake has got to be in my top 5 favorite cakes. From the spices of cinnamon and nutmeg to the textures of walnuts and carrots, there is nothing that will stand in the way of me and carrot cake. That is why I have decided to try and incorporate carrot cake into my life in an innovative and healthy way. Now that I’m getting older, I am more aware of how many sticks of butter it takes to achieve the perfect taste of carrot cake. After experimenting, I have found a way to not only indulge my desires completely guilt-free but to also do it for breakfast. You’ll need a few key ingredients for that classic carrot cake taste, such as carrots, of course! 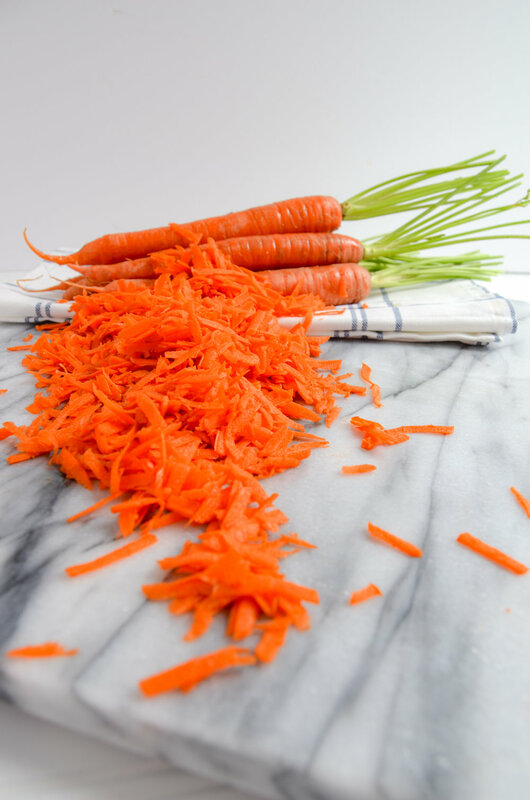 I prefer starting with fresh carrots so I can medium grate them to get more of a crunchy texture, but if you prefer to have a well-blended batter then you can finely grate your carrots or put them in a processor. Be sure to pat your grated carrots with paper towels or a kitchen towel to absorb excess liquid so it doesn’t make your batter too liquidy. Another key ingredient is the spices. Now, you can go about this either two ways: You can mix a ratio of cinnamon, ginger, and nutmeg, or you can simply use a pumpkin pie spice mix. Both seem equal in flavor, I just had leftover pumpkin pie spice from the fall days and I basically use it in all my pancake batters! Prepping for the pancake batter is a breeze. Just add your dry ingredients to your wet ingredients and then use a spatula to fold in the walnuts and grated carrots. It is important that you let your batter rest for at least 10 minutes so that the starch molecules in the flour can absorb the liquid in the batter. This causes them to swell and gives the batter a thicker, more viscous consistency. This allows time for the air bubbles to slowly work their way out. Now, onto my favorite part… The cinnamon cashew cream cheese! It really takes the cake in this recipe (no pun intended)! The cashew cream cheese tastes almost like confectioners sugar to me. It has the perfect amount of sweetness thanks to the pure maple syrup. It’s so addicting that I will literally make an extra batch of this and sneak it in the fridge to take a spoonful (or three) out of the jar when I need to satisfy my sweet tooth! 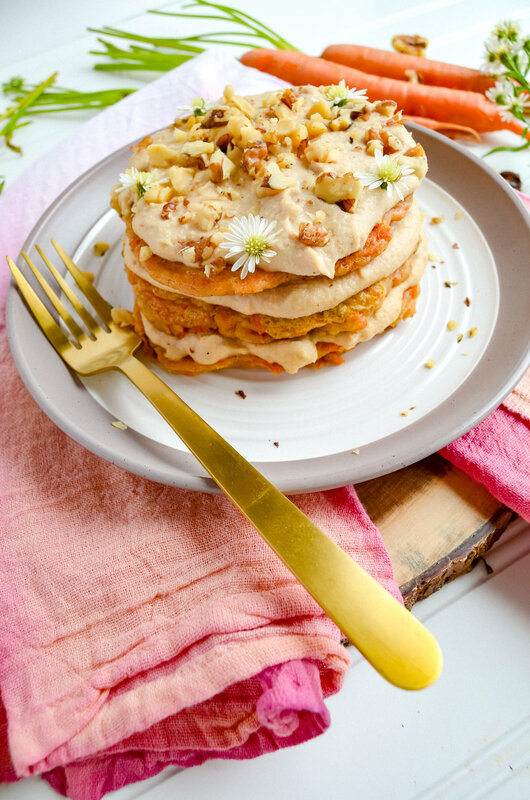 Vegan, gluten free and oil free take on a classic carrot cake pancake that is sure to please everyone! Paired with an irresistible cinnamon cashew cream cheese that you can’t help but lick right out of the bowl! To prepare the batter, in a medium bowl, add both flours, baking powder, baking soda, spices, and a dash of salt. In a separate bowl, add applesauce, milk, vanilla, and sweetener and mix until combined. Add your dry ingredients to your liquid ingredients and mix until combined. Gently fold in the walnuts and carrots and let the batter sit for at least 10 minutes. Lightly coat your skillet with vegan butter or coconut oil over medium heat. When the skillet is hot, add about ¼ cup of the pancake mixture to the pan. Cook for 2-3 min or until the bottom of the pancake is brown and bubbles have formed on the outside. Flip and cook for 2-3 min or until brown and fully cooked through. While pancakes are cooking, add cashews, maple syrup, milk, lemon and cinnamon to a processor and pulse on high for about 4 minutes or until mixture is smooth and creamy in texture. Add additional maple syrup for a sweeter taste. Layer pancakes with cream cheese and top with walnuts and maple syrup! Make sure to grease your skillet in between batches as well as to keep a consistent strain of heat. If you let your skillet get too hot, then the pancakes will be crispy and brown on the outside but mushy and raw on the inside. Since the pancakes are vegan, an egg is not present, so let your batter rest is key to get that perfect fluffy texture. If you are short on time, you can actually boil the cashews! Just cover cashews with water in a small saucepan and boil over medium-high heat. As soon as the water boils, turn the oven off and let the cashews sit in the saucepan covered for 1 hour. Can be easily made into waffles! If eggs are not an issue, I would recommend substituting applesauce for 1 egg and omitting almond flour.